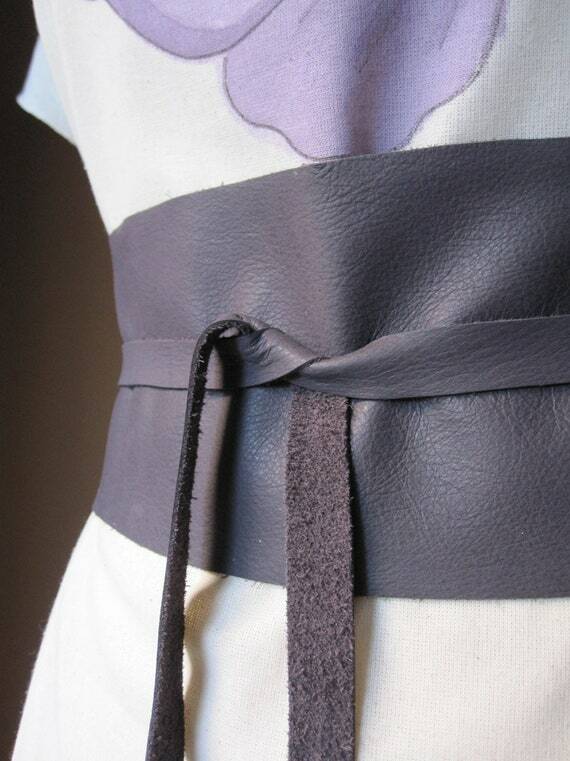 I handmade this beautiful obi belt using Italian leather in a beautiful antiqued lilac colour. Limited quantity of leather! It is long more than 200cm (central part -waist- 68cm), wide from 5.5 to 10.5cm and can fit any size. It’s worn by Betsy (my dummy) that measures 87 – 67 – 90 cm. If you’re interested in something like it, in different colours, contact me for a custom item (prices may vary). I’ll be happy to work for you! The OOAK hand painted butterfly dress shown is not included, but it match perfectly the Obi belt. Please note that the leather I use for my belts or bags comes from factory off-cuts. I love to recycle and transform these pieces of leather into quality items that are functional and stylish. I’ll ship the obi belt within three days of receipt of PayPal payment with priority airmail. If you would like me to ship any item a different way please convo me. 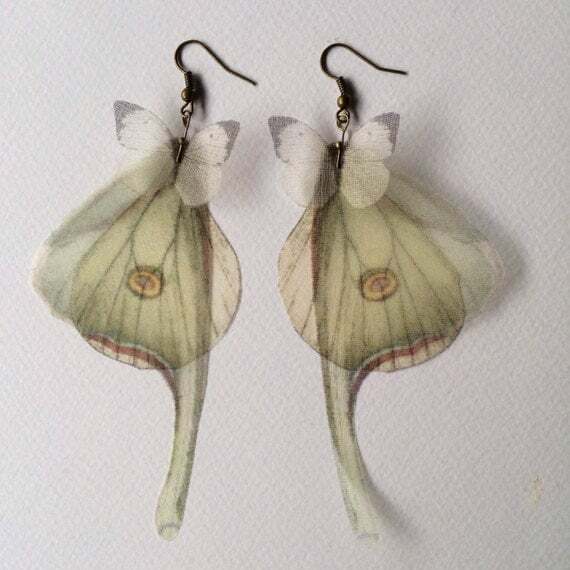 Completely hand-made earrings, with silk organza butterflies. I chose butterfly images one by one, from real pictures and vintage illustrations. Then I printed them on high quality silk organza, cut and fixed using antique bronze findings (nickel free). 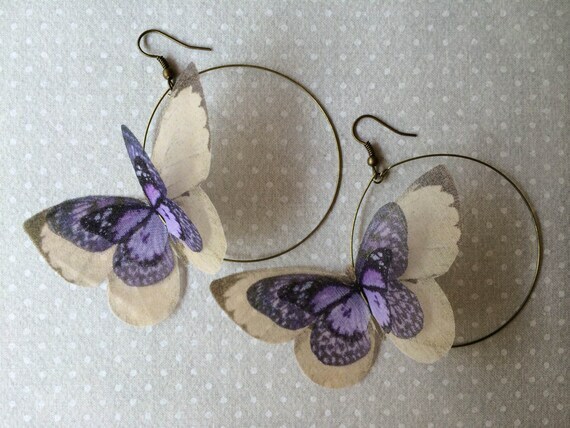 There are 6 butterflies on these earrings, and they measure about 7 cm. Antique bronze earrings are long 7 cm. These butterflies will fly to you with Priority airmail (Poste Italiane service), cheapest and fastest way but not trackable then I highly recommend to choose Registered airmail. However I’m not responsible for lost, stolen or damaged items, when they leave my hands. Choosing Registered airmail, you’ll receive the tracking number and track your package in www.poste.it/en web. Convo me for prices. Please note: I will accept PayPal only. Orders will ship within one week of receipt of PayPal payment. 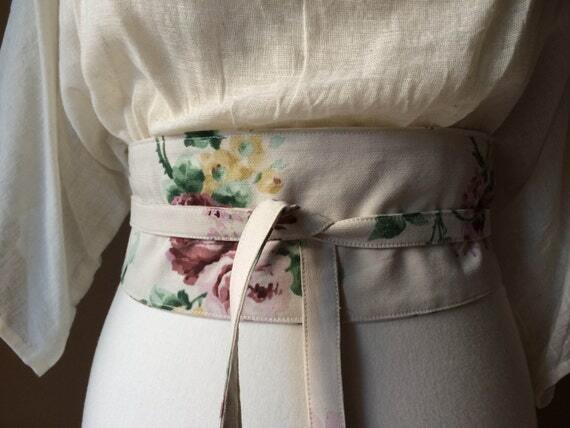 I handmade this beautiful obi belt using a lovely hand dyed ivory cotton fabric with floral illustrations. There are lot of romantic colors: different shade of pink, green, yellow and beige/ivory. Perfect with any outfit, lovely with jeans! It is long more than 200cm (central part -waist- 70cm), wide from 5.5 to 10.5cm and can fit any size. This obi belt can you feel like a tree fairy.. it is so natural, so easy but really special! The ivory gauze and jersey shirt shown is not included. Contact me if interested, thanks! I’ll ship it within one week of receipt of PayPal payment with priority airmail. Then I printed them on high quality silk organza, cut and fixed using antique bronze findings. There are 6 butterflies (and wings) on these earrings, and they measure 11 x 5 cm. I handmade this gorgeous dress coat jacket using unbleached cotton (looks ivory) and a lot, lot, lot of love. Completely hand-drawn by me and hand-sewn in my work-showroom in Italy. You can’t find this dress anywhere! It’s really confortable to wear. Very feminine! A little bit victorian. 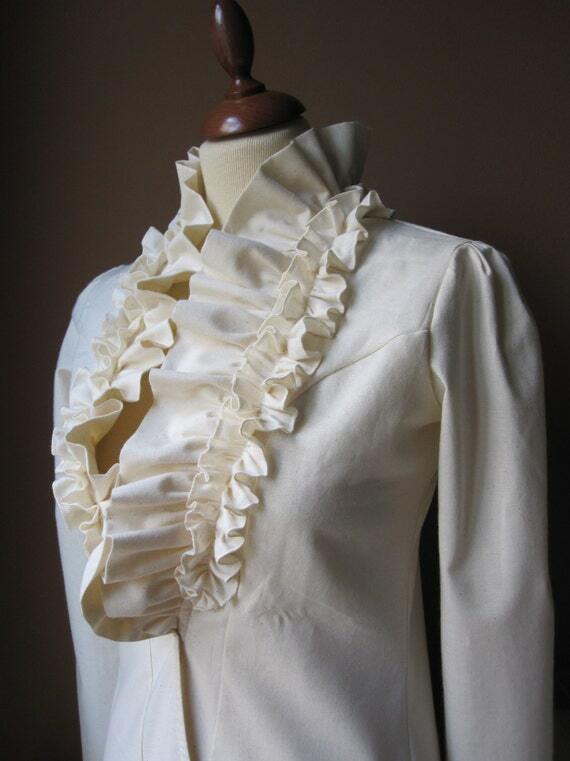 The neckline is completely covered with ruffles (double layers). I added a little hook on the waist. I think it is perfect for the wedding day too!!! Please look pictures carefully, the dress is very detailed and accurate in every particular. Shoulder to shoulder 37 cm. Total lenght about 100 cm. It’s worn by me (I’m a 40-42 Italian size) and by Betsy (my mannequin) that measures 87–67–90 cm. Convo me with your measurements and I’ll create your dress coat! The dress can be hand- or machine-washed, up to 40 ºC, and it can be ironed (cotton temperature). If you’re interested in something like it, in different sizes, fabrics or colours, contact me for a custom item (prices may vary). I’ll ship it within 3 days of receipt of PayPal payment with registered airmail (sure, fast and trackable). 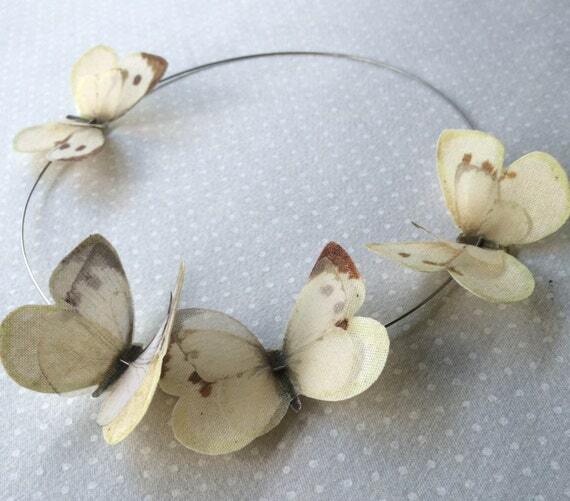 Completely hand-made necklace, with silk organza and cotton butterflies. Then I printed them on high quality silk organza and cotton, cut and fixed using nickel free metal findings. Wearing this necklace, you wear a butterfly! There are 8 butterflies on this necklace, 4 different images of pieris rapae (white and Ivory), and they measure about 6.5 x 5 cm. each one. Antique silver heavy duty wire. In pictures I’m wearing a SMALL size.